I’ve uttered that word numerous times throughout this NBA postseason, and it’s almost always a response to something LeBron James has done. How is he able to routinely pour in 30-40 points despite playing over 40 minutes a night? How did he essentially carry his entire team through the first round match-up against the Indiana Pacers? How can he decimate the Toronto Raptors with 43 points on a night when he practically couldn’t miss? How is he doing all of this in Year 15 of his career? I never know the answer. I never will. What I do know, though, is how much time people are wasting taking all of this for granted. 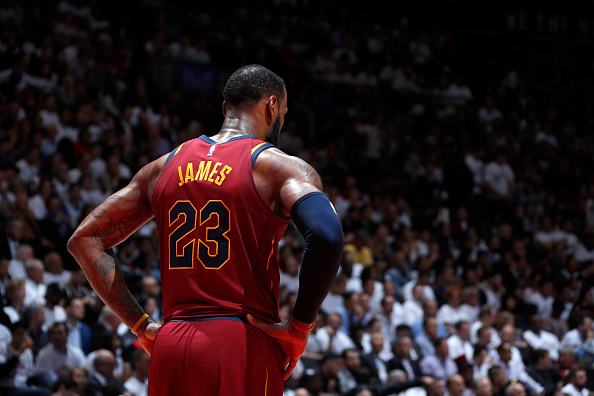 Cleveland Cavaliers fans see these performances as something of a routine, while many around the NBA are making a living questioning James’ greatness. To everyone doing this, I have a simple message – stop. Realize what you’re missing. Don’t waste your time doing anything else but taking in every moment James provides in a Cavalier uniform. Trust me, I get the temptation to criticize at times. While I don’t partake in the Michael Jordan debates anymore, I do fight the urge to take his presence for granted on particularly off games. A disengaged showing in the series opener against the Pacers had me jumping to question his effort. I realize the error in my ways. You should, too. Those who spend their days spitting out tweets about how overrated James is, how he’d struggle if playing in a different era, they’ll be the ones who miss this the most when he’s gone. They’ll look back at James’ career with regret, knowing they should’ve taken in the greatness we’re all witnessing instead of wasting so much time trying to discredit it. They’ll desperately try and find someone new to compare him to, despite knowing full-well we’ll never see anything like this again. I’d like to think I wouldn’t have to share this same warning with Cavs fans. They know plenty about life without James, enough to realize they need to savor every moment they have with him in Cleveland. These supporters recall (not by choice) the days of watching the Jordan-era Chicago Bulls terrorize every attempt the Cavs made at a deep postseason run. They remember years of losing, failed attempts to find star players (see: Kemp, Shawn) and bonehead moments such as Ricky Davis shooting at his own hoop in attempt to notch a triple-double. They painfully recall the days after James headed to South Beach and left the Cavs in ruins. When, instead of watching the greatest player in our generation will his team to victory on a nightly basis, we were instead treated to 26-game losing streaks, depending on players like Samardo Samuels and watching Cleveland fall to a Los Angeles Lakers club with only four active players. To those fans, I beg you to recall those bleak days when you see something like what we witnessed last night. Think about them when you watch James casually pour in 40+ point games. When watching him in the postseason gives you a disarming sense of confidence. When him tearing apart another playoff opponent feels like nothing more than par for the course. I ask this of you simply because it won’t be like this forever. This time of having the best player in basketball on your team, wreaking havoc against opponents on a nightly basis, it has an expiration date. Those days of fledgling Cavalier basketball will eventually return, and we’ll once again see the postseason as nothing but a pipe dream. I’m not saying this to be bleak. I’m just reminding you why it’s foolish to do anything but savor every moment of having James on this team. I don’t know when his time as a Cavalier comes to an end. It could be this summer. It could be years from now. When his Cleveland career does finally conclude, though, I hope you’ll have taken in the spectacle we’ve been experiencing. I hope you’ll have spent those days embracing a once-in-a-lifetime athlete instead of trying to tear him down, inexplicably stacking him up against other NBA greats. I hope you’ll have realized how amazing it is for a Cleveland team to have a player so good opponents can only stop him by hoping he has an off night. If that’s not what you’ve been doing, I can’t even begin to imagine the sense of regret you’ll feel when James finally hangs them up for good.